God of War received universal acclaim from critics, being praised for its narrative, world design, art direction, graphics, characters, and combat system. Essential for all Kratos fans. Brand New, Never Used. See pictures for details. GET IT FAST ~ US SHIPPER We combine shipping. Just add Items from our Ebay Store, to your cart and request an invoice. Take a look at all the amazing deals on our Ebay store at http://stores.ebay.com/retrotime. Be sure to sign up for our Email list and News Letter to make sure you don’t miss out on our great sales. 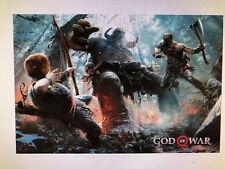 Loot Crate God of War 4 World Serpent Poster 14"x21.5" GET IT FAST ~ US SHIPPER. Condition is New. Shipped with USPS First Class Package. 2.Non-defective and Right Products. We really feel very happy to make you content for our responsible service. Defective or Wrong Products. Colors may not appear exactly as seen on photo in real life due to variations between the computer monitors and naked eye color difference. Other than that all color intact and no tears. 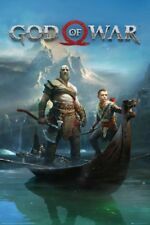 We know that all the God of War titles are now rated 'M' for mature! Pretty cool! We're happy to help. We do not accept P.O. Boxes. Essential for all Gaming Fans. Although they don't have the collectible value of the scarce originals from the 60's and 70's, they do provide a very economic alternative for those interested in sharing the political history of the second half of the 20th Century.